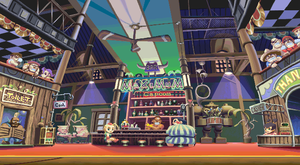 Every stage in Pocket Fighter contains a number of cameos and references to other Capcom games. This page will attempt to describe them all. All references are described as they appear from left to right. Click on the thumbnails provided to see the full image in its original size. Please note that the quality of the images is not perfect, but as close as possible. Issues like parallax scrolling makes it difficult to create images. 1 Dee Jay's Bar "Maximum"
3 Ski Resort "La Menkoi"
Standing in the balcony above the restroom are Guy, Rolento, and Rose. Below the "Toilet" sign, Birdie is standing behind the restroom doors, and he cries every time the combs his hair and it gets messy. In the corner to the right of the restsoom, Guile appears to be enjoying a drink with his friend Charlie. Cammy is bouncing on the first bar stool on the left. Dee Jay is quite naturally acting as the bartender of what appears to be his bar, or at least a bar named after him. He dances throughout the fight. E. Honda is sitting on the bar stool to the far right, watching Cammy bounce. To the right of the bar, the large statue holding a flower pot is of Huitzil. Star Gladiator's June is manning the cashier's post by the exit. In the balcony above the cashier, you will see Sagat, M. Bison, and Adon. The character in the sombrero looks similar to a selectable character in Capcom's Pang 3. We see the giant fighting mech Blodia from Cyberbots off in the background to the left. Standing on the balcony to the left of the shop is Donovan Baine, presumably looking for Anita. Below Donovan, M. Bison is standing alongside a very young Cammy, who is insisting on a toy that she sees in the window, with Bison steadfastly refusing to buy it. The Shadowloo logo can be seen in the upper showcase below the "50% Off" sign. Above Bison and Cammy's head, there is a "POW" icon etched into the bridge, which has appeared in several early Capcom games such as 1942 and SonSon. The sign in the window is a direct reference to Plasma Sword. 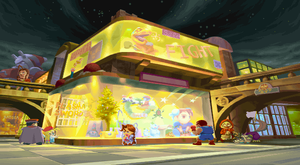 There are several other indirect references, including final boss Dr. Bilstein's mask to the right of the sign, and dinosaur Rimgal in the showcase above the store. A Hologram of a June doll blinks in and out of the window in different orientations. Anita is standing in front of the store, clutching her headless doll. There are several other Darkstalkers references in the showcase, including snowmen (Sasquatch), a frog (Rikuo), and what appears to be Hsien-Ko riding Santa's sleigh, being lead by a team of pandas instead of reindeer. Balrog is peering in to the display window at the oversized Chun-Li doll. To his right, beneath the street bridge, B.B. Hood is seen, very mercilessly holding an uzi to Jon Talbain's head, who is holding a white surrender flag up with his tail. The only indication of the store's ownership, a sign pointing to the toystore feature's Dhalsim's face. Vega appears in his usual outfit, complete with claws, on the left side of the stage, and appears to be having difficulty with his skis. 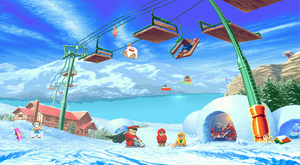 M. Bison is thoroughly enjoying himself, passing back and forth in the close background, moving from left to right on a sled, and then zipping back from right to left on skis. Something is partly buried in the snow to the left of Vega which features the Shadowloo logo. Up on the ski lifts, from left to right, you can observe Oro sleeping in his hanging sleeping bag, Sasquatch casually hanging from the wire, and Balrog desperately hanging on to the side of a ski lift chair that appears to have broken off of a hinge. Just below the lifts, way off in the background, you can see Yun and Yang periodically hucking themselves off the mountain above on snowboards. Yang's name is printed on the underside of his snowboard. Inside of the snow hut, Sodom and Bishamon sharing a noodle dish. The dog seen outside of Bishamon's stage can also be seen outside of the hut. Elena is standing off to the left, enjoying an ice cream. Blanka can be seen manning the hut situated in his Amazon homeland. The hut is depicted as the Safril inner-tube rental shop. Rikuo appears to be struggling to escape the mouth of the giant snake that is wound around the tree outside the hut, while a smaller merman cheers him on. 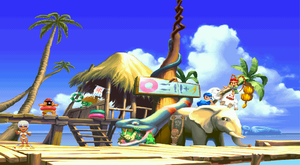 This snake can be seen as an homage to the snake seen in Blanka's original Street Fighter II Brazil stage (from which also the photographer next to the hut was drawn), but it has also been suggested that it refers to the snake boss in the first Resident Evil. Dhalsim is using his stretching arms to wash the hide of his elephant who is situated besides the hut. Dhalsim's wife is perched on top of the elephant. Two members of Sasquatch's clan (who are severely geographically misplaced) are attempting to reach the bananas at the end of the tree, but are being blocked by Red Earth's Mai Ling. 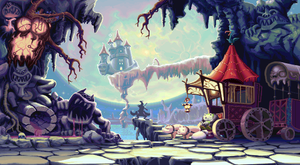 The lying statue of Buddha which is normally featured in many of Sagat's stage backgrounds can be seen off in the distance on the right end of the screen. The face in the far left is largely ambiguous, but it most closely resembles Guy. Jon Talbain is perched atop the giant roast pig. Below him, Gen is about to butcher a duck while he looks on at the customers in his restaurant. Many characters can be seen eating noodles. The stationary ones are, from left to right, Birdie, M. Bison, Fei Long (perched above), Sodom, Dhalsim (floating over the restaurant sign), Victor and Bishamon. In motion, Rolento is practicing a stealth crawl along the ground while he eats. Behind Bison and Sodom, a flame can be seen pacing back and forth, and is most likely a reference to Pyron. 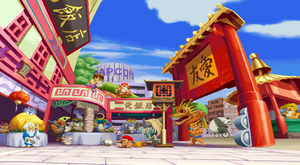 On the right portion of the stage, Adon is standing idly beneath the large street sign, and behind him, Charlie is eating ramen by himself. Capcom's Japanese corporate building is depicted in the background, partially obscured by trees. Tessa's room is largely absent of cameos, but full of various Red Earth references. As long as Morrigan is not one of the fighters in the room, Lilith can be seen relaxing on the window sill above a treasure chest. Red Earth's Leo is sitting in front of the fire, polishing his sword. 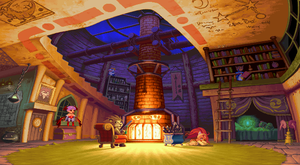 As long as Felicia is not one of the fighters in the room, she can be seen taking a nap on the floor to the right of the fire. The penguin in the witch hat standing in front of the bookshelf above the bed is a possible reference to Sasquatch's Dark Force penguin attack. The ghost sleeping on the bed is of the same kind of the one which Tessa launches in her Jamming Ghost attack. There are a number of markings and diagrams on the ceiling, including one image on the left side (usually obscured by the health bars) depicting dinosaur/dragon hybrid Hauzer. This desolate castle silhouette scene is situated in the twisted demon realm of the Makai, home to the warring lords of the Darkstalkers. Seen howling in front of the large moon is, naturally, Jon Talbain. The ghoul sitting in the driver's seat of the pig-drawn carriage is one of Morrigan's faithful servants. 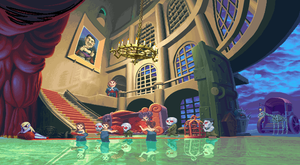 Further indication that these may be the domains of the Aensland is the fountain at the left end of the stage, which is the same (proportionally enough) as the one seen in Morrigan's stage in all Darkstalkers games. Laying against the rolled up red carpet in the lower left corner is Jedah Dohma; specifically, the female form that Jedah takes when attacked by Demitri's Midnight Bliss attack. Demitri appears at the top of the stairs, viewing the fight below. However, sometimes he can't help himself, and he teleports down to the floor below, and goes sliding across its slick waxed surface on his belly for fun. To the left of the horse skeleton sitting in front of the carriage by the entrance, you can see the Iron Maiden used by Donovan Baine in one of his EX Moves. The scene apparently depicts Demitri moving into a new residence. Ghouls and skeletons are lugging his belongings into the castle. His servants dance throughout the fight, while one particular woman looks on with a bored expression. In the Sega Saturn and PlayStation versions of the game, there is a mode called Running Battle. This mode works like a Survival Mode. Running Battle uses an exclusive and continuous stage, with its own background music (the track is called "Never give up", by Isao Abe). Your character must walk through the stage from left to right. There are many intervals (battle points), where the player must stop and face an opponent (the last one is always Akuma). From Breath of Fire III, there's "young" Ryu and "young" Nina watching the battle, and Peco is near by. Kumiko Shiozaki (from Quiz Nanairo Dreams) is standing to the right side. Monuments in the desert relate to Anakaris. Peco and Kumiko are still visible. From Quiz Nanairo Dreams, we can see the Player 1 character talking with Megumi Moritsugu. Momoko Fujikura is spying them with envy. P1 Character, Megumi and Momoko are still visible. Mega Man Volnutt (from Mega Man Legends) is standing to the right. Mega Man Volnutt is still visible, accompanied by Roll Caskett (also from Mega Man Legends). Roll Caskett is still visible. There's a poster with Felicia in the wall, with the word "CAT". Rose and Oro are sitting against the wall in the background. The Felicia poster, Rose, and Oro are still visible. Rush, Roll and Mega Man (from original Mega Man series) are standing to the right. Rush, Roll and Mega Man are still visible. Xavier, Princess Devilotte and Dave (from Cyberbots) are under the Super-8. Serv-bot and Tron Bone (from Mega Man Legends) are off to the right. All characters from the previous point are still visible. X and Iris (from Mega Man X) are now in the scene. Along with X and Iris from the previous point, Zero (also from Mega Man X) can be seen. From Breath of Fire III, Momo and Ryu in his adult form are present. Momo and Ryu are still visible. Also from Breath of Fire III, Nina (adult form) and Peco can be seen. This page was last edited on 15 August 2016, at 18:21.